Both hose connections are 1 3/4". The lower hose connection curves up slightly. The transmission cooler in the bottom tank has 3/8" inverted flare fittings on 12 1/2" centers. The filler neck is on the driver side. The side mounting brackets are set for a factory non A/C car and place the radiator on the engine side of the radiator support. US Radiator copper radiators are made to bolt in exactly as a factory replacement radiator would. They are available in several core designs such as three rows of 1/2" tubes on 9/16", 7/16" or 5/16" centers as well as in three or four row versions. All US Radiators can be ordered with an electric cooling fan & shroud combo. The top tank of the radiator can be polished to show off the vintage brass look. This particular radiator can be ordered in a variety of configurations to suit your cooling needs and your budget. 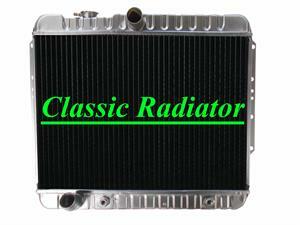 Even the largest radiator cannot cool properly without good airflow. Consider replacing your stock 4 or 5 blade fan with a six or seven blade fan for optimum cooling.